Biotechnology Calendar, Inc. selects a winner for our Five Star Program at the end of every life science event. The Five Star Winners are sales reps who we believe are great communicators. These sales reps draw large crowds to their booths and interact with attendees. Their exhibits are eye-catching, and they often conduct demonstrations. Five Star Winners show great salesmanship skills when it comes to life science marketing, and they go the extra mile to meet researchers. The sales reps who are most successful at Biotechnology Calendar, Inc. life science events are outgoing when it comes to approaching attendees, but they also spend a lot of their time listening. Many attendees come to our life science events with a specific goal in mind. They may not know exactly what product they want, but they might know what problem they would like to solve in the lab. Five Star Winners listen to attendees so they can identify each researcher’s problem in the lab and what each researcher would like to accomplish. Once a sales rep has identified a problem, he or she can recommend a solution. A sales rep may have the right product or service to address the researcher’s problem. Five Star Winners will explain how their company has worked to develop a product or service that is the missing puzzle piece in a researcher’s work. By focusing on the researcher’s problem, a sales rep can gain a researcher’s trust. Rather than spending too much time talking about products and services that don’t fit in with a researcher’s goals, sales reps should pick the one that does fit and explain why they think it’s the right solution. Each Five Star Winner receives a framed certificate, an e-mail sent out to all of our vendors announcing their award, a post on our website with their company’s logo and a link to their company’s website, and a blog article highlighting their fantastic performance at life science marketing and working to meet researchers. Exhibitors who win Five Star Awards at more than one life science event have a better chance of being selected as the overall Five Star Winner at the end of the year. 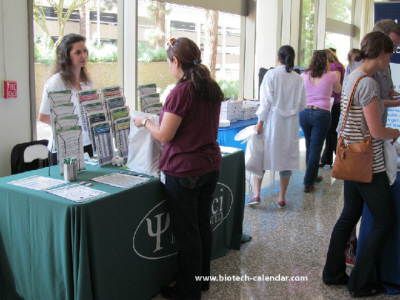 Biotechnology Calendar, Inc. is very excited to announce our most recent Five Star Winners at our life science events. Click here to see a full list of our 2013 life science marketing events. Congratulations to the winners for your outstanding life science marketing skills and working to meet researchers at these shows! Congratulations to this October’s Five Star Winners in California! We hope to see you again soon.